It was a whirlwind visit but I’m glad we started traveling soon after I arrived because, even after living in Germany for 5 years, there is still so much left to see and do in Germany, let alone the rest of Europe. At the time, Italy was still on the lire (it was about $1.00 to 2, 189.84 Lire) and, since I am math-shy in public, John did all the calculations for us. Ah, back when the dollar was doing well and traveling Europe was ‘cheap’. Nothing I can say here about Venice that hasn’t already been said a million times. Yes, it is lovely, crowded, has an interesting history and a sinking future but I do hope everyone has the chance to see it once in their lifetime as it is a place like no other. 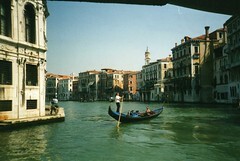 It’s easy to get turned around among the canals and I was so worried Logan would fall into the water. Good thing I could still carry her ~ barely. I only went to Venice once but John somehow managed to visit two or three times ~ something about it being work-related. Interesting how that worked out.